It’s always nice to celebrate Sundays with old friends. Last week we were pleased to see long-time supporter and all around wonderful lady Myra Romano. 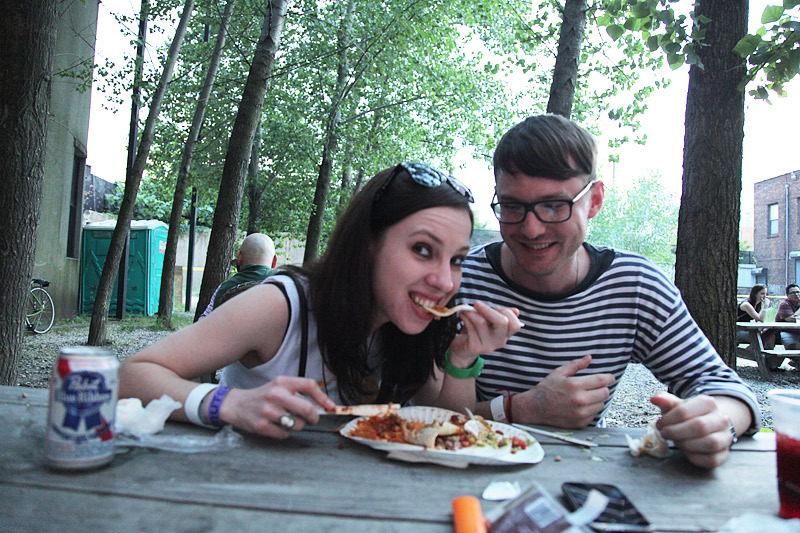 We caught her and her friend Matt Leutwyler while they were sharing a huarache. Earlier in the day, Myra had complained of pain around her torso, and opted to give dancing a break. Well, turns out that the pain she felt was a symptom of pneumonia! Thankfully all is well and she is on a proper regimen of meds. Myra is so incredibly diehard. MSN: Sorry for interrupting your meal. So whats your story, Matt? Matt: Well, I am friends with Myra and I enjoy going to parties with her. I am into producing house music and dance music, like new disco and stuff. I find that I’m lucky to live in such an area where house music is really accessible. It’s definitely not a common thing in this country, let alone the world. MSN: Have you been to any other major cities in the US? Matt: Well, I was in Chicago for a little while, and although it’s widely considered the birthplace of House music there is not as vibrant a scene as there should be. They might have two or three big outdoor events during the summer with house music but that’s it. MSN: That’s a shame! Myra, what do you think? Myra: Well, I agree – and I’d have to say that I think New York is top notch for parties. I’m from Peekskill, NY originally, and I followed an ex-boyfriend to Wisconsin about seven years ago. There is definitely a lot of ravers in that state and the surrounding area. I would end up driving to Chicago for parties but like Matt said, there wasn’t anything like New York. MSN: Any parties you’ve been to recently that you’ve enjoyed? Myra: I just came back from the MUTEK festival in Montreal. It was absolutely amazing. And Montreal is probably the only other city I’ve been to where I can really see myself living. Well, we hope you stay in New York for a while! Get better, Myra. There’s a party this Sunday, you know.